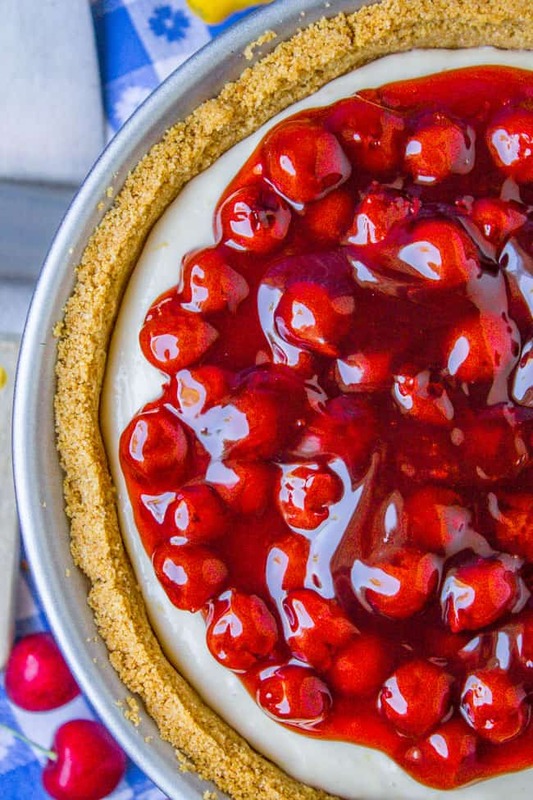 A crunchy graham cracker crust, a creamy lemony center, topped off with cherry pie filling! Prepare the crust. If baking your crust, preheat your oven to 350 degrees F.
In a food processor, blend together the graham crackers, salt and sugar until fine and completely ground. (If you don't have a food processor, throw the crackers in a ziplock and crush with a rolling pin.) You can also use 1 and 1/2 cups store bought graham cracker crumbs. Dump the mixture into a pie pan. No need to grease the pan. Use the bottom of a glass or the bottom of a measuring cup to press the crumbs into the bottom and up the sides of the pan. At this point you can either refrigerate the crust for 1 hour (do this if you don't have air conditioning!) or you can bake the crust for 10 minutes at 350. Refrigerating results in a more crumbly crust, baking will get a sturdier crust that is a little more crunchy. But both methods work great. Cool the crust completely if you baked it. I put it in the freezer for a bit. In a large bowl or stand mixer, beat the cream cheese until it is smooth, scraping the sides and bottom of the bowl. Add the sweetened condensed milk, lemon zest (optional*), lemon juice, and vanilla. Beat well, scraping the sides, until everything is incorporated, and then stop. Pour the filling into the cooled crust, and spread smooth on top. Place the pie in the refrigerator for 2-3 hours, until completely chilled. Put the unopened can of cherry pie filling into the fridge at the same time so that it gets cold. When you are ready to serve, open the can of cherry pie filling. Spread it over the top evenly. Slice and serve! Source: I feel like this recipe is all over the place (I saw many sources citing "my grandma so-and-so") but I got the details from Allrecipes.com.